Coyotes are territorial animals that are common throughout Cuyahoga County and all of Ohio. Coyotes have coexisted amongst us in Lakewood for years, rarely being noticed. Today, there are at least groups, living in Lakewood. A group lives in the Madison Park vicinity, another lives in the Lakewood Park vicinity. Because coyotes are here to stay, it is important to learn to safely coexist with them. Coyotes serve an important role in the local ecosystem by keeping populations of smaller wild animals and vermin in check. 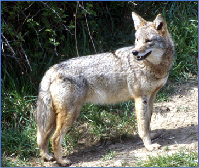 Coyotes in our area are usually grayish brown, but coloration can vary from buff to black. They have yellow or amber eyes, large ears and narrow, pointed muzzles. Most adults weigh 40 pounds, but their full coats and long legs can make them appear larger. Coyotes residing in urban environments are typically nocturnal, unlike their counterparts in natural surroundings. This is most likely behavior adapted to avoid human contact. These animals switch their activity to be more active at night when human activity is minimal. They instinctively avoid people. Coyotes can be most active at dawn and dusk. Coyote breeding season is usually January through March, with pups produced April through May, denning through August. Coyote dens can be found in hollowed out tree stumps, under rock outcrops, on a slope, under brush, or even in some open areas. Urban areas provide a bounty of natural food sources for coyotes, who primarily hunt small mammals such as mice, rats, and rabbits. They will also eat fruit and berries. They occasionally scavenge unsecured garbage, pet food and compost. Both males and females will hunt. Coyotes will regularly hunt in the same area if food is regularly available. According to Lakewood’s Animal Shelter Supervisor, Elaine Hearn, there has never been a recorded coyote attack on a human in our area. However, coyotes that have become habituated to humans may not show fear when encountering humans. Habituation may result from coyotes’ exposure to a constant source of food or repeated exposure to humans without negative reinforcement. Incidents can occur with coyotes who have grown accustomed to people, due to being fed by humans (deliberately or not). Never intentionally feed a coyote, and remove any food attractants in your yard. Coyotes may prey on small unattended domestic pets, such as cats and small dogs, if given the opportunity. Keep your pets safe by taking essential measures to eliminate the risks. Deter coyotes from coming around your yard and reinforce coyotes’ natural fear of humans by using “hazing” methods”. Hazing is the term used for methods to drive off a coyote from an area or discourage undesired behavior. Using a variety of different hazing tools is critical because coyotes can habituate to individual items, sounds, and actions. Use noisemakers (e.g. your voice, whistles, air horns, bells, soda cans filled with pennies or dead batteries, pots and pans banged together). Use projectiles (e.g. sticks, small rocks, cans, tennis balls, rubber balls). Please throw these objects toward the coyote, not at the coyote. Try other repellents (e.g. hoses, water guns with vinegar water, spray bottles with vinegar water, pepper spray, bear repellant, or walking sticks). Click here for a video on how to haze a coyote.